"I have never set out to be a role model or an inspiration in the diabetes world. I was just doing what I love to do and I found solutions with my own diabetes care that allowed me to do it." The road to my interview with Kris Freeman starts when he posts this picture on Twitter as the Sochi Olympics are beginning. 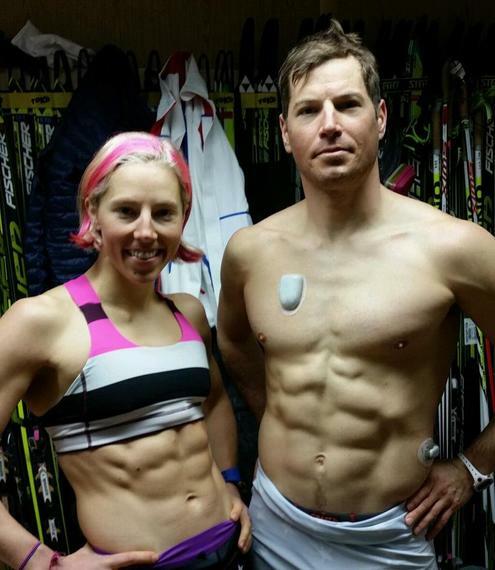 The photo of Kris and his fellow U.S. cross country teammate Kikkan Randall (say Key-Can) caused me to have two distinct thoughts: "I am significantly out of shape," and "This reminds me of a point in my life when I was afraid that my daughter Arden was too lean to wear an insulin pump or continuous glucose monitor (CGM). I immediately reached out to Kris and inquired about using his image in a blog post that I wanted to write called "Worried Your Child Is Too Lean For An Insulin Pump Or CGM?" Kris very generously agreed, and then I asked him if he would be willing to do an interview with me after he arrived home from Sochi. Scott: When you posted the photo, was this just you celebrating the games starting with a friend, or did you have an idea that it would help people who wear insulin pumps and CGMs? Kris: We were just playing around... we were both just taking off our wet shirts from training and I was like, "Hey this might be cool, lets take a picture." I told Kris how I wanted to use his photo to help lend Arden's Day readers the same support that I was offered many years ago on Twitter. It was then that a woman in her 30s reached out and told me that she was lean (like Arden) and had no trouble finding good sites for her pump. That brief conversation took away my apprehension about Arden starting on an insulin pump, and I wanted to return the favor. "My blog posts are fine," I thought, but this picture of Kris is certainly more inviting, informative and poignant then any words I could throw together. It really makes the point that a person can find a pump or CGM site no matter their body type. S: The blog post that included the picture of you with Kikkan is one of the most popular posts that has ever appeared on my blog. Seeing an insulin pump and CGM working on such a lean person was inspiring for so many people who live with Type I diabetes and their parents. S: What is your average body fat when you are in competition shape? K: I go off of a body fat monitoring scale, and I range anywhere from 4 to 8 percent. The scale has some inaccuracy in it depending on your hydration level, but I harbor around 5 to 6 percent normally. I asked Kris if he knew the average body fat for an adult, he wasn't positive but he guessed it may be around 20... I looked down as he was speaking and thought, "What must mine be...?" S: How many hours a week do you train to maintain that level of fitness? Kris gave a complete answer about varying his effort: "Each month I'll have two hard weeks and two easier weeks, so that my body doesn't get used to a certain load ... I also change the amount of volume from month to month". He says that he trains the hardest in August and September and then through October, November, December the volume comes down but that during those months, "I train harder, I ski faster, do intervals... training my anaerobic system instead of my aerobic system ... If you want to just know how man hours a week I average, last year I trained about 900 hours for the year. That includes one off day a week and illnesses that don't allow me to train." I did some quick math, and it sounds to me like Kris trains on average of 20 to 22 hours per week, or the equivalent of the amount of exercise that I did between 2008 and 2010. K: My biggest training days are five to six hours, and the smallest is one to two. S: Since there isn't always snow available, how do you train for cross country year round? K: I do a lot of dry land training, I use roller skis. They look kind of like roller blades but they attach with the same boot and binding as my skis. They are remarkably good at mimicking the muscle use of skis, it's just a different feeling to be rolling instead of gliding. S: When we were watching you ski at the Sochi games it occurred to me that your life is kind of like a living diabetes blog. That the simple act of you going about your day is an act of support and relief for people who live with diabetes and the people who love them. I've received countless letters over the years that thank me for sharing our life with diabetes here on the blog, people often say that it "saves" them. I was wondering, do you see that your presence in the public eye is doing the same for people? K: I have never set out to be a role model or an inspiration in the diabetes world. I was just doing what I love to do and I found solutions with my own diabetes care that allowed me to do it. I was alerted that what I was doing was inspiring other people, and so over time I've embraced the image of a role model but it was never something that I thought of (about) myself. I tried a few more times to give Kris credit for the example that he provides for the diabetes community, but he remained very humble. I could tell how incredibly pleased he was that his life as an Olympic athlete is uplifting to the community, he insisted that he is glad he can inspire people but, "I'm still just me and I'm trying to be the best ski racer and person that I can be, I don't get out the door every day and think I'm going to be an inspiration." I told Kris that when we watched him compete at Sochi I was struck by the amount of effort and training that cross country requires and thought that it must seem, to most people who have diabetes, to be something that is out of reach for them. I wondered aloud if people with diabetes identify with the image of him working so hard to reach a difficult result. S: Your life is a figurative example of diabetes. There is no end to the amount of effort that you have to put in, your footing is never secure and it almost always feels like you are slogging up an incline. I guess you can paint parallels between almost anything, but this one seems pretty obvious. It's possible that when people are watching you ski, they see themselves in your effort. I hear it in your voice and I've spoken with you before... I know you're not trying to be a role model, and I'm not a big believer in role models. I don't think that anyone should be looking to other people and expecting them to live their life in a certain way, but when it happens organically, it's beautiful. You're living a blog... and it's helping people. We spoke about the interview that he did with The Olympic Zone on NBC, and I remarked at how popular it was in the diabetes community. S: The NBC interview was shared online, liked and commented on furiously. In my opinion it helped people to understand that their diabetes can't hold them back and it takes away some of the fear that parents of children with type I may have. Seeing you on that stage doing this incredibly difficult thing, it lets parents know that their kids lives can still be all that they hoped for when they first held them as newborns. How does it feel to hear that and to have the support of so many people who identify with you? K: For sure, knowing that people are watching and are encouraged by what I am doing is inspirational to me. Similar to the advocacy work I do with Lilly visiting summer camps. * I know that I'm having a strong impact on other people... even though it's hard for me to believe. I know in the back of my head. S: Does competing at such a high level change your definite of success? I know you weren't happy with your results at the games. K: I've been fourth at the world before at the World Championships, which is the same level of competition as the Olympics, so finishing in the 50s was not impressive (to me). I was not on my A game at the Olympics, I wish that I could show what a diabetic can do, but at the same time... maybe that doesn't matter to the (diabetes) community. Maybe it just matters that I was there and that I'm a competitive athlete. S: The difference between first place and last was only a few minutes, I guess in your world that's an eternity, but I was like, "Sh*t I'd give them all a medal." Is that kind of a finish motivation to keep going? K: I've been closer in my career, and I know what I'm capable of when I'm at my best and I was just not there. That happens. I missed something in training, my coaches and I still don't know (what) but usually it becomes apparent later. The drive to be the best in the world is the same drive that gets you to the Olympics. You don't get to the Olympics because you are satisfied with where you are. You get there because you want to be the best in the world and when you get there, you want to be the best (on that stage). K: This reminds me of a question that I get at the camps a lot. People ask, "Are you the best diabetic athlete in the world?" I always say I don't think about that and I don't really care if I am or I'm not, I'm trying to be the best athlete and skier that I can be. I don't identify myself first and foremost as diabetic person. It's part of who I am, I've never been ashamed of it. I'm very open with it and I like educating people about the disease, but it is not my primary identifier. S: How do you rebound from Sochi, is it more metal or physical? S: In regards to the answer that you just gave, I see a strong correlation between it and diabetes. Do you see that as well? S: Do you have Olympic aspirations for 2018 in South Korea? K: I'm not going to rule it out, but I'd say the likelihood isn't great. I'm will only continue ski racing as long as I can stay at a very high, international level. Definitely racing next year and if I continue to race to my standards then I will continue the next year, and the next year and that year will be an Olympic year. If I'm tired and my body is not responding to training anymore, as sometimes people don't when they reach my age, then this next year will be my last year. But I don't expect it to be. S: So your professional skiing goals are to keep skiing and doing your best, and see where that leads you? K: I have higher goals than that. I'd like a top 10 finish at the World Championships next year, I'd like to stand on top of the podium again at U.S. Nationals. I think that those are both attainable goals, they are also high goals. I'm not interested in staying in the sport to watch my skills slowly deteriorate. I want to stay in while I'm still competitive and I'm going to give myself another year to do that. S: What do you want to do after skiing ends? K: I plan on venting my competitiveness by going into semi-pro triathlon, the very next year. S: Aside from the competitive nature of the sport, what do you love about skiing? K: One of the coolest things about cross country skiing is that you never have to stop, you don't get to the bottom of a run and have to get on a lift. Every time I do it I get a little better at it, a little more efficient. To just know that I can go out and ski 50 miles without being exhausted, just kind of gliding... it is really cool. I've been exposed to and competed in all kinds of skiing, but cross country is what brings me back. S: I wanted to finish by sharing something with you. The day after your NBC interview Arden went to school and talked about you during her share time. She told her class that she knew a man that was in the Olympics and that he skis on "those really difficult courses. His name is Kris and he has diabetes just like me, he even wears the same insulin pump and CGM as me." Because of our level of transparency, the other children and teachers are very aware of Arden's diabetes. Even though they see it up close, there are still many who believe that it will limit her. I told Kris that Arden was able to stand in front of her class and tell everyone (in essence) that this person who is competing at the Olympics, this guy who looks like a superhero -- he's me. I don't have limits. S: I'm pretty sure that if Arden did that the next day, well, I bet a lot of kids did the same and I'm certain that people with diabetes everywhere also felt that same message of hope and fearlessness from watching you. K: I hope that's true, I think that so many of the limits that are placed on diabetics are based more on ignorance or outdated ideas of what the disease means. I like to say that there are no limits to diabetes as long as you take responsibility and treat it. Lilly Camp Care Package -- * Camps run by the ADA and the Diabetes Education and Camping Association. Lilly supports the camps by donating supplies.